I was wondering if it would be possible and practical to put an aluminum sleeve or tube over a wood spoke. The OD of a spoke is 1 1/4 Grainger sells Aluminum tubing, 1.250 In ID, 1 1/2 In OD, in 6 ft. lengths. I’m not sure it would be possible to press the sleeve on the spoke and if it could be done does it make sense, will it strengthen the spoke. There must be a story there Mike ?? It was about front brakes for your T.
Aluminum sleeves would stop just at the location of the break in the photo and would not add any strength where needed. But really if you have good straight grained hickory spokes it does take quite a bit to break them and if you do break them the break is likely caused by the accident and not the cause of the accident. Those broken spokes may be oak? Oak is much more brittle than hickory wood. 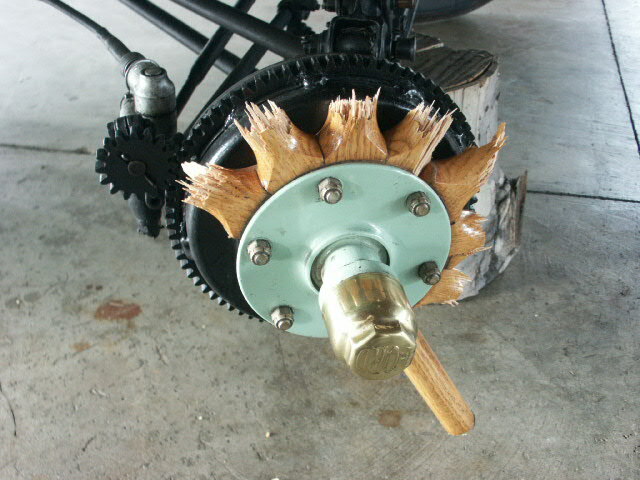 Many people have mistakenly used oak for wheel spokes over the years. Usually, they are lucky and do not break. 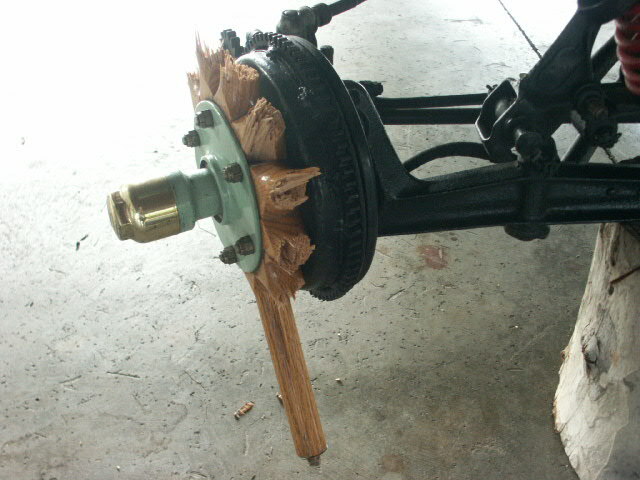 Good, tight, wood wheels rarely break without some kind of collision (which can be with a pothole or road rut). Provided the wheel was in good condition with proper wood? Broken wheels are usually the result of an accident, not the cause of one. There is a "window of opportunity" where oak spokes will break, hickory will not because hickory has more resilience. I have seen those photos before. I think those may have been Ralph's wheels from before he put the wire wheels on his car? I seem to recall something about railroad tracks? I ordered my spokes from Langs right as they switched over and forked out the 10.50 each for hickory, but with no markings and no real way to tell this stuff has me on edge. I wish there was a way to tell oak from hickory. Travis, I would think any reasonably experienced woodworker could tell oak from hickory pretty much at a glance. The spokes in the photo sure look like red oak to me---not even as strong as white, much less than a good straight grain hickory. For a really nifty aluminum solution, check out the thread on "Becky's New Blue T." The shop putting it together made an entire one-piece aluminum wheel (felloe and all) that when painted looks just like an original wood item. I don't know how it will hold up in service but I thought it was clever. I think Rick Bonebright actually makes aluminum spokes. He lives in Missoula MT and is on the MTFCA board. Aluminum spokes: $660 to $792 for spokes for 4 wheels. Not too bad if they're good forever. Wonder how they "press" with no "give" at all? I agree with John - that wood sure looks like red oak. Rick's aluminum spokes are tapered on the hub end. Every other spoke is tapered the opposite way, so they wedge together tightly when the plate is drawn up. The broken spokes you pictured belonged to Ralph Ricks. They were red oak and that's why they broke. Use only hickory in your wood spokes and you won't have anything to worry about. Just drive safe and have fun. Aluminum spokes: $660 to $792 for spokes for 4 wheels?? Lang's wood spokes $504.00 for 4 wheels. If you’re not looking for original why use wood when aluminum is better. Stronger, safer,last longer and the look good polished or painted! Read their flyer completely. It is $1162.00 for 48 bare spokes. Powder coating another $120 for 48. Remember that when you strengthen one part of a structure, you effectively weaken something else. Putting an aluminum sleeve on a wooden spoke will stop the flex except where the sleeve ends, and that is where it will break with much less force then if the sleeve was not there. As far as telling hickory from oak, that should be easy. Oak is one of the most porous woods with very large cells. this is why it is used for barrels as the wood will absorb water very quickly and swell too seal a barrel. The poor wood grain structure is what makes it popular for furniture as it looks pretty. Good quality wood looks rather bland, because the wood grain is very fine and undefined. The point Gus makes is a very good one and it goes well beyond just spokes. Adding power, four wheel brakes, and all manner of other "upgrades" forces out the next weakest component. I personally like our T's the way they came out of the assembly plant, with or without some period correct accessories. They work just fine as long as they are used within the originally intended parameters. I re-wooded my stock trailer side rails with clear white oak with a very fine straight grain. I bought it directly from the mill. Hickory is for spokes but red oak and white oak are two much different woods. Red oak makes pretty floors and furniture but white oak is much stronger and in my case,not very pretty for furniture, but maybe better than necessary for a stock trailer. There is no doubt that hickory is the best wood for spokes but I think there are other woods available that will adequately suffice. I don't think oak should be outright condemned. If you hit a curb, tow sideways on asphalt, get caught up in rail tracks or ruts or turn excessively hard, hickory may withstand, however those are unusual circumstances. I have made wood spokes with oak, birch, walnut and hazel nut woods and they don't just break. Driven normally on good roads there is no problem. I think hickory is a better wood for spokes than oak, but I once saw a T with oak spokes that was in front of me turn a corner too sharp and go up on two wheels. The wheels didn't break (thank heavens). You read the "Traditional" spoke price from their example. The plain aluminum spokes are at the bottom of the page. How many times have you been asked "are those wooden spokes"? I can't imagine having to explain that they are aluminum. Doesn't sound very Model T like. If you skip the aluminum and pretty oak and simply do things Henry's way with hickory, paint and reasonably driving, there should never be a problem. Travis -- It is easy to tell Oak from other woods if you look at the end grain. Oak has "Rays," which are structures in the wood perpendicular to the annual rings. In other words, they go from the center of the log outward, like rays from the sun in a child's drawing. The rays are very hard and a lighter color than the rest of the wood. If you're looking at the end grain of a piece of Oak, they are obvious. I intended to post just one pic showing rays in Oak but got a bunch of them instead. The one in that bunch I wanted to post is called "Oak end grain with black-line spalting in the sapwood." It shows the rays clearly.